Don't ever look directly at the Sun through a telescope unless you have the proper filters fitted by an experienced astronomer. If you do then you will be permanently blinded. The retina does not produce pain signals and you may have no idea that damage is taking place until later. DO NOT RISK IT. Looking at the Sun with the naked eye will damage your eyes and they will deteriorate. We recommend an adult supervises you if you are involved in daytime observation, preferably one who has conducted such observations before. The easiest way to observe the Sun safely is by projecting its image onto paper or card. A small hole can be put in a card and the light projected onto paper. The outline of the Sun can then be seen. Never leave this unattended as the Sun is a powerful source of heat and may combust your materials. Some projection tools include the Sunspotter or Solarscope which make it easier to do this. 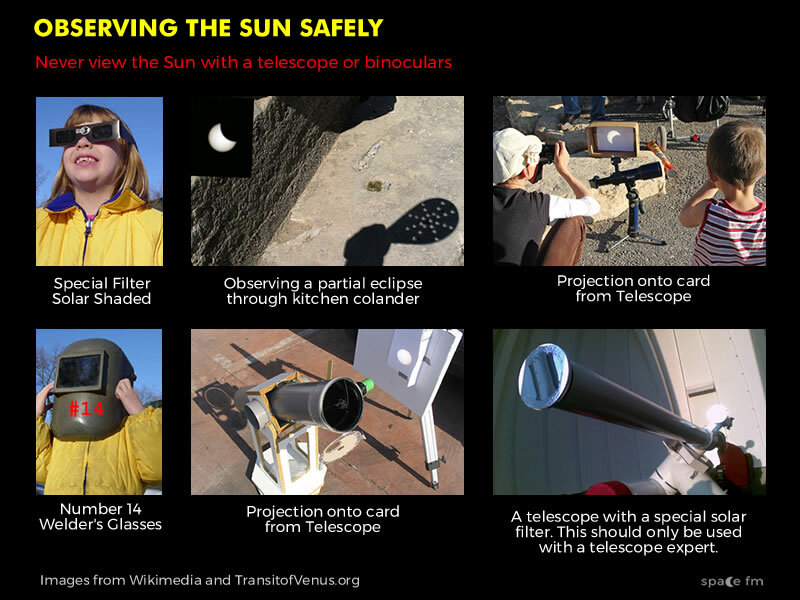 Telescopes with special solar filters can be used to project the Sun. Great care must be used as the Sun can crack these tools. Some specialist retailers offer special solar shades that contain a protective coating allowing the Sun to be viewed. However these should not be scratched in any way and the shades should conform to the highest quality. A popular method is to buy the strongest welder’s glasses on sale. These are Number 14. The Sun appears green when wearing these, and they are considered to be safe as long as they are in good condition. The Moon is safe to view except when it is near the Sun in the daytime and also just before and after a total solar eclipse. Annular eclipses are NOT safe to view. Observing at night brings some practical difficulties, primarily because it is dark. Be aware of objects around you, expecially with telescopes and tripods. Bring a torch, preferably one with a red bulb or filter, to help you spot obstacles. Take special care before going to remote places to observe on your own. Observing with friends or family in familar environments is more fun. This involves pointing the telescope at the Sun and using the eyepiece (NOT LOOKING INTO IT) to project the image of the Sun onto card or a smooth surface. An additional practical warning is to make sure the finding scope on the side is not used as the heat of the Sun tends to melt the crosshairs on some models. H-Alpha (or Hydrogen Alpha) is a specific wavelength in the visible red part of the spectrum. It allows astronomers to study the Sun's surface as well as emission nebulae. Optical H-alpha filters are attached to a telescope (by experienced astronomers) allowing the observer to study the Sun by focusing on this narrow bandwidth and filter out others. Projecting sunlight through a small hole onto a smooth surface is a good way to view the Sun, especially during a transit or partial solar eclipse. A kitchen colander is also a good tool. There are numerous pages on the web to find out about making one. It is unsafe to directly observe the Sun with the naked eye, telescope or binoculars. What are safe methods to observe the Sun?